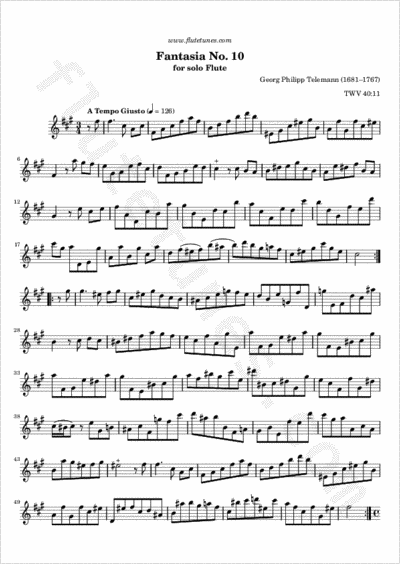 Telemann's tenth Fantasia for solo flute is in the key of F-sharp minor, and takes the form of a Baroque suite. It starts with an Italian corrente marked “A tempo giusto”, to be played “at the right speed” with flowing quaver motion. The following Presto is a gavotte, but it is usually played noticeably faster than a regular gavotte. The fantasia ends with a moderate-tempo 3/8-time minuet, displaying typically Baroque flourishes.